Until today I didn't know that the Northern Territory of Australia lays claim to being a UFO hotspot. UFO spotter Alan Ferguson is spreading the word with a promotional website featuring the latest local UFO photos and videos. There are plenty of photos that seem to have face-value interest but I watched a bunch of videos without managing to spot a single UFO - all I could see was shaky shots of a cloud and a tree. And as for the commentary, let's just say I wasn't completely engaged. I found Alan's website via a local news item so he's doing something right with his publicity. The website shows examples of local UFO signage and displays which seem to indicate some support for the UFO theme in his area. 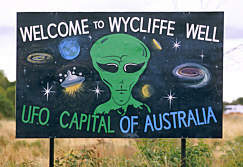 But I've never been there - can anyone tell me how serious or widespread the UFO theme is in the Northern Territory?